File Name: William S. Hardy of Brady, Texas. Notes: Brady is the city closest to the center of the state, about 125 miles northwest of Austin. 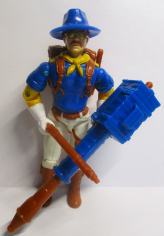 Notes: Sunbow's Wild Bill wore a completely different outfit from the original figure: light tan hat and black sunglasses, a blue shirt with orange closed vest and no gloves, and blue pants with a brown belt, grey boots, and no leg holsters. In his early commercial animation he was designed and colored like the figure. The Reel FX Wild Bill was based on the 2002 Version, with lighter pants and silver kneepads. Cobra CLAWs Are Coming to Town 123 seconds 10 lines at HQ on Christmas, captured, flying a F.A.N.G. Valor vs. Venom 50 seconds 7 lines flying Thunderwing, flying Night Attack Chopper, at Joe HQ, delivering Electric E.E.L. Hardy served as combat infantryman and participated in LRRP (Long Range Reconnaissance Patrol) operations during South East Asian debacle. Reenlisted for Flight Warrant Officer School and has since remained in service. Specialized Training: CLASSIFIED. Qualified Expert: M1191A auto pistol (prefers single action .45 long Colt revolvers), XM-16 attack rifle. Amiable and slow talking. Fancies himself a country-western singer. Totally honest in personal dealings, but not beyond spinning a tall tale for the amusement of comrades. Toy Notes: Item #6025. 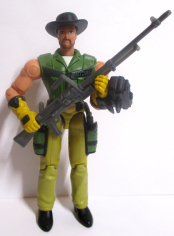 Was to be recolored as part of 1988's Tiger Force but was dropped for unknown reasons. Recondo was assigned to the Tiger Fly in his place. Accessories: red-brown "Colt .46 side arm" with wood-grain texture (new), blue "CRT-92A" spring launcher with box-like back end and red-brown trigger (new), red-brown spring missile with ring around conical tip, red-brown knife with fuller on blade and wood-grain texture (new), blue soft-plastic Stetson hat (new), red-brown backpack with engraved grenades and canteen, with clips on side for knife (new), black figure stand (common). The original G.I. Joe helicopter pilot, WILD BILL is also an expert tracker and can function on the ground as well as any expert infantry scout. He adapts the hunting skills he learned as a boy whenever he's tracking the enemy in "his own backyard." As he says: "Sneaking up on a Cobra is a sight easier than sneaking up on most critters. Cobras don't smell as good." Wild Bill doesn't believe in being undergunned. His weapon is the new XM-207 hyper-velocity missile launcher, which can punch a hole through six inches of laminated armor. Motto: "Of course they only sent one pilot...me, because you only get one firefight!" Toy Notes: Item #6742. In the 1992 insert catalog, concept art appears instead of the actual figure. Accessories: red-brown pistol (92 Wild Bill's), blue spring launcher with red-brown trigger (92 Wild Bill's), red-brown missile (92 Wild Bill's), red-brown knife (92 Wild Bill's), blue hat (92 Wild Bill's), red-brown backpack (92 Wild Bill's), black figure stand (common). Accessories: dark blue hat (92 Wild Bill's). Two-Pack Accessories: two graphite mini-revolvers with straight grip (new), brown-grey rifle (86 Leatherneck's, with Sound Attack tab), red-brown Stetson hat with thick black headband (new). Mission Disc Accessories: two graphite revolvers (02 Wild Bill's), black rifle (86 Leatherneck's), black knife (91 Low-Light's), red-brown hat (02 Wild Bill's). Soft talking, slow walking, easy-going, and hard-riding, WILD BILL might have been a cavalry trooper, a real horse-soldier in another age. These days, the horse of a cavalry trooper eats jet fuel instead of oats and comes with rotor blades instead of a saddle blanket. A lot of chopper pilots won't think twice about taking you into a hot landing zone. They come in low over the treetops, flare, drop down low enough so you can jump without breaking a leg, and then they are out of there. When you need out of that LZ, when the enemy triple-A is working overtime, and when you think no pilot in his right mind is coming in for you - WILD BILL will. NEO-VIPERS get on his nerves. He thinks that anybody who goes to all that trouble to be the best at what they do should at least have the sense to know right from wrong. "It's my job to get the boys in to do their job, and if that means hanging tough in a hairy situation, that's okay. That's what I get paid for. Heck, if it was easy, they could get anybody to do it." Toy Notes: Carded in a two-pack with Neo-Viper. Item #57490. Reissues: Carded in February 2004 in the Gum Bitz figure single-pack assortment (Item #50402), and in April 2004 with Mission Disc #3 (Item #55336). The Gum Bitz and Mission Disc filecards lack the sentence about Neo-Vipers and add "I'm the bus driver" to the beginning of the quote. Missile Storm Accessories: dark green helmet with black forehead (02 Duke's). Night Force Grizzly Accessories: dark green hat (02 Wild Bill's). Soft talking, slow walking, easy-going and hard-riding, WILD BILL might have been a cavalry trooper, a real horse-soldier in another age. These days, the horse of a cavalry trooper eats jet fuel instead of oats and comes with rotor blades instead of a saddle blanket. A lot of chopper pilots won't think twice about taking you into a hot landing zone. They come in low over the treetops, flare, drop down low enough so you can jump without breaking a leg, and then they are out of there. When you need to get out of that LZ, when the enemy triple-A is working overtime, and when you think no pilot in his right mind is coming in for you - WILD BILL will. NEO-VIPERS get on his nerves. He thinks that anybody who goes to all that trouble to be the best at what they do should at least have the sense to know right from wrong. 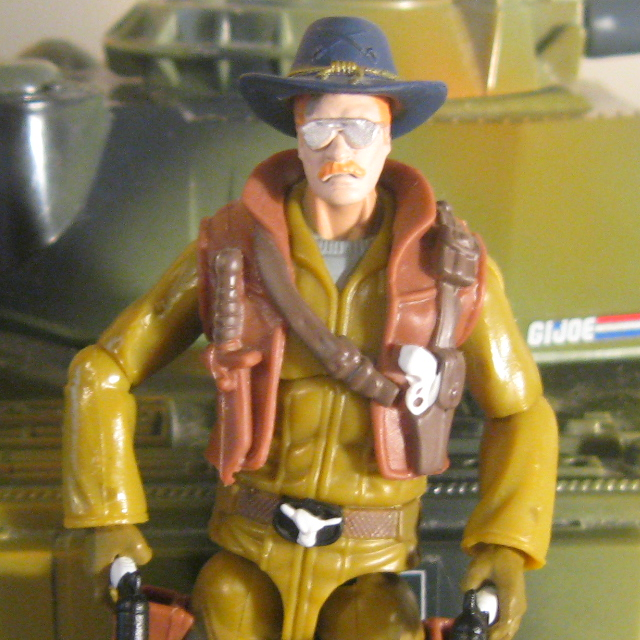 Reissues: The vehicle and figure were released boxed in October 2004, in Valor vs. Venom packaging and with the Sound Attack features removed. Also boxed in October 2004 with the Night Force Grizzly vehicle. Accessories: two graphite revolvers (02 Wild Bill's), brown-grey rifle (86 Leatherneck's, with Sound Attack tab), brown hat with black headband (02 Wild Bill's). Toy Notes: Carded in a two-pack with Roadblock. Item #56915. Accessories: brown helmet with black forehead (02 Duke's). Soft talking, slow walking, easy-going, and hard-riding, WILD BILL might have been a cavalry trooper, a real horse-soldier in another age. These days, the mount of a cavalry trooper eats jet fuel instead of oats and comes with rotor blades instead of a saddle blanket. With WILD BILL at the controls that helicopter can gallop like the wind, take a turn like a thoroughbred at the track, and stop on a dime. A lot of chopper pilots won't think twice about taking you into a hot landing zone. They come in low over the treetops, flare, drop down low enough so you can jump without breaking a leg, and then they are out of there. When you need to get out of that landing zone, when the enemy is working overtime and the tracers are thick in the air like angry bees, no pilot in his right mind is coming in for you - but WILD BILL will. His easiest job so far? Tracking down COBRA SWAMP RAT troops. "You can smell those slimy sewer-skulking critters even when they're a mile underground," he says. "I'm the bus driver. It's my job to get the boys in to do their job, and if that means hanging tough in a hairy situation, that's okay. That's what I get paid for. Heck, if it was easy, they could get anybody to do it." Toy Notes: Carded in a "Value Zone" vehicle pack with Sand Viper, Recondo, a recolor of the Missile Storm, and a mini-comic. Item #54117. Accessories: two silver old-style Colt Peacemaker revolvers (new), bronze machine gun (91 Big Ben's), black Stetson hat (new), black communications gauntlet (04 Duke's). Slow-talking and easy-going, WILD BILL doesn't let anything shake him up. In situations where other people might lose it completely, WILD BILL just keeps on doing his job. This doesn't sound like much, but it means a lot to the G.I. JOE team if they are pinned down on a hot landing zone waiting to be picked up. Piloting a helicopter in combat requires a unique combination of skill, stamina, physical coordination, and spatial perception. Helicopter pilots are trained, not born. WILD BILL feels a measure of pride in his hard-won skills, and to him, COBRA COIL CRUSHER is no better than an athlete pumped up with steroids. He knows that anything that isn't earned has no value. "Any old fool can fly into a hot landing zone. Getting out is the hard part." Toy Notes: Carded in a two-pack with Coil Crusher. Item #55960. Accessories: two grey revolvers (04 Wild Bill's), grey machine gun (91 Big Ben's), black hat (04 Wild Bill's), black communications gauntlet (04 Duke's). Toy Notes: Carded in a two-pack with Coil Crusher. Item #00283. Accessories: two black revolvers with white grip (04 Wild Bill's), blue Stetson hat with gold headband tied in front (new), brown open vest with dark brown holster and knife (new), black Joe figure stand. Accessories: two black revolvers with brown grip (04 Wild Bill's), dark brown hat with brown headband (08 Wild Bill's), dark grey helmet with black goggles and mic (08 Capt. Ace's), black vest with brown holster and knife handle (08 Wild Bill's), black Joe figure stand. Toy Notes: Boxed in a Toys 'R Us-exclusive three-pack with Capt. Ace and Skyduster. Item #36144, set 1 of 3. Accessories: two white revolvers with black grip (04 Wild Bill's), tan hat with white headband (08 Wild Bill's), blue helmet with black goggles and mic (08 Capt. Ace's), orange vest with grey holster and black knife handle (08 Wild Bill's), black Joe figure stand. Slow talking and easygoing, WILD BILL doesn't let anything shake him up. In situations where other people might lose it completely, WILD BILL just keeps on doing his job. This doesn't sound like much, but it means a lot to the G.I. JOE team if they are pinned down on a hot landing zone waiting to be picked up. Piloting a helicopter in combat requires a unique combination of skill, stamina, physical coordination, and spatial perception. Helicopter pilots are trained, not born. He can pull maneuvers in the air that defy gravity (and sanity), and he has a pretty mean right hook - just ask SCRAP-IRON. Toy Notes: Carded in a two-pack with Scrap-Iron and an original comic (#12). Item #31531. Accessories: two light brown revolvers (04 Wild Bill's), light brown hat (08 Wild Bill's), yellow helmet with black goggles and mic (08 Capt. Ace's), dark green vest with yellow holster (08 Wild Bill's). Slow talking and easygoing, WILD BILL doesn't let anything shake him up. This might not sound like much, but it means a lot to the G.I. JOE team if they are pinned down and need serious backup. Piloting a VTOL aircraft in combat requires a unique combination of skill, stamina, physical coordination and spatial perception. WILD BILL can pull maneuvers in the air that defy gravity (and sanity). Always willing to lay himself on the line for his team, WILD BILL's been in more crashes than anyone can count, but he always manages to get back on his feet - and right behind the yoke again. "You've got an aircraft that can dogfight, bust a bunker, and drop down into a war zone and lay down sustained machine gun fire to cover our guys? Not many pilots could fly a machine like that. Good thing you've got me." Toy Notes: Boxed with an update of the Tiger Rat. Item #40142. 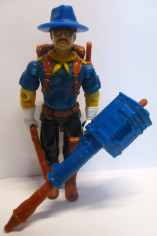 Note that this Wild Bill did not come with a personalized figure stand.